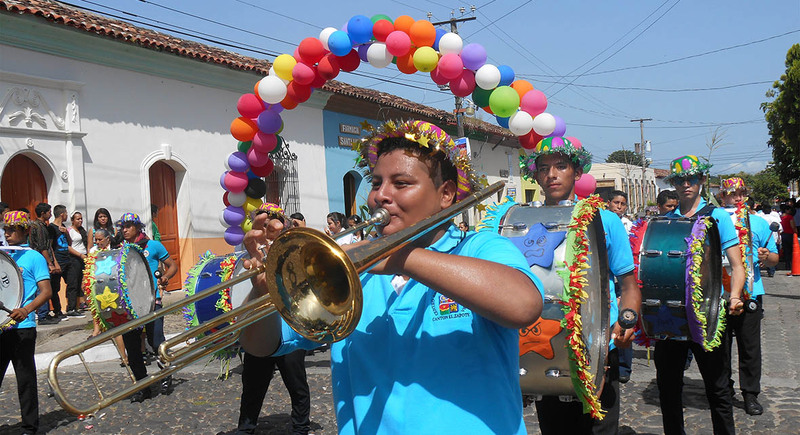 The grand procession through the streets is one of the biggest events on July's month-long calendar of the town's anniversary celebrations. 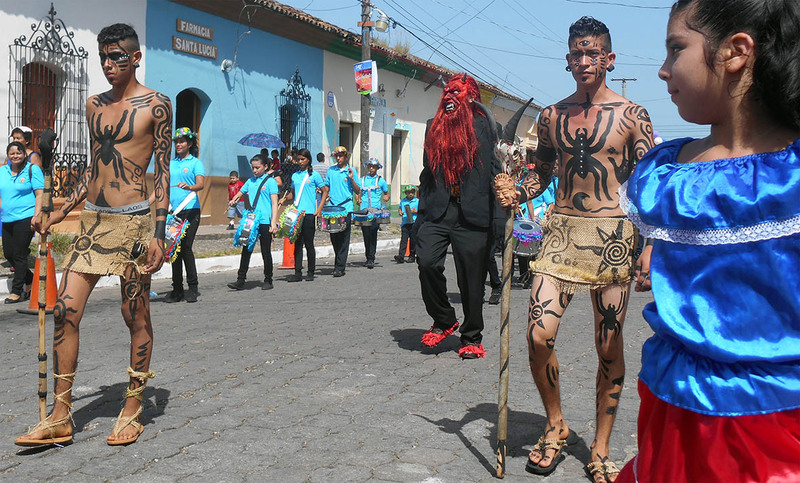 Prominent parade marchers gave tribute to indigenous culture, with bare-chested young warriors in hand-woven loincloths, bodies painted with black symbols and large spiders, faces swirled with war paint. They brandished sticks with animal skulls atop and protruding black horns, and were followed by a tall, gaunt devil with long fiery locks. A Pipil princess in a decorative headdress had the train of her brightly colored dress carried by two serving boys, who were equally adorned with vibrant cloth and body paint. The colonial period was represented by loping young boys in simple whites and straw hats, girls in full-circle skirts accented by rick-rack zig-zag trim. Fancy dress was on display with women in flowing period gowns, shielded from the strong sun by their dainty umbrellas. A troupe of pint-sized drummers marched in uniforms with military shoulder fringes and gold-banded berets. 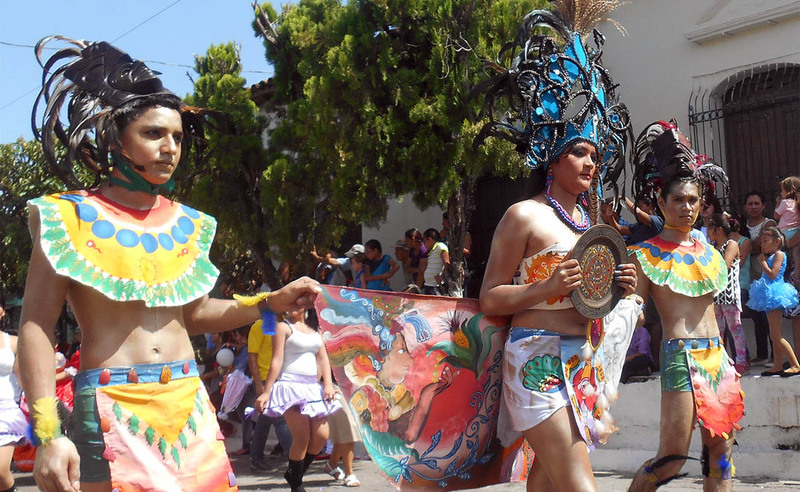 Folkloric dancers flapped and flouted colorful dresses down the cobblestone streets, accompanied by stilt walkers, playing to the crowd with arms akimbo. Clowns clowned, children marched as alligators and chickens in paper-mache costumes, as did older students with banners that boasted their schools. A lively modern brass band brandished rainbow-colored hats that would feel right at home on a New Orleans strut. 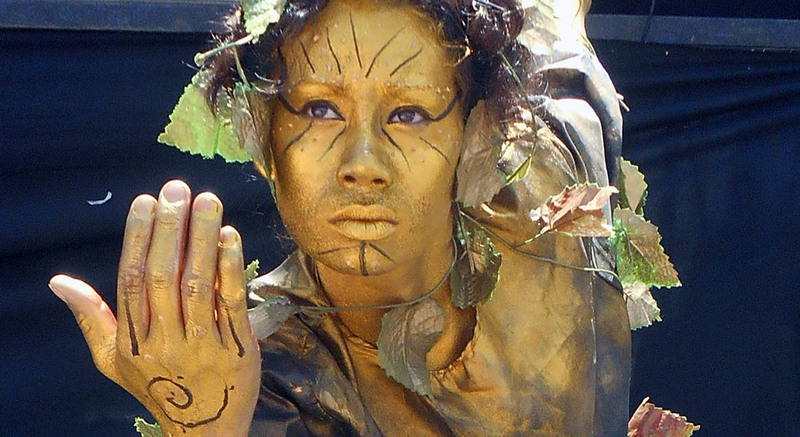 Each pack of paraders ended in the central plaza in front of Santa Lucía Church, where a row of nature-themed living statues stood sentry before a main stage that would be the focal point of the day's festivities to follow.